The Schacht Wolf Pup 810 Loom is a Wolf Pup / Baby Wolf hybrid! 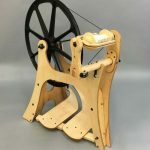 With 8 harnesses and 10 treadles and a weaving width of 18″, this compact loom weaves like the Baby Wolf with the size and portability of the Wolf Pup Loom. I have been hoping that Schacht would make the Wolf Pup with 8 harnesses. It will be the perfect loom for taking to 4 or 8 shaft weaving workshops. The Wolf Pup 810 Loom looks slightly different than the Baby Wolf Loom. The brake will be different and the legs will be somewhat different. View it on our site here. 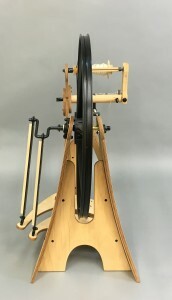 Schacht’s NEW Saxony Style Flatiron Spinning Wheel can be set up with the flyer on the left or the right, has 3 tension modes (Double Drive, Scotch Tension or Bobbin lead), a thoughtfully designed fine threaded tension control, fully adjustable drive wheel, and self aligning bronze bearings in the flyer maidens. The bobbins are easy to change with their clever quick release lever. The drive wheel is 22.5 inches in diameter. The Flatiron Wheel weighs just 15 lbs and ships packed flat! Bobbins, Whorls and Flyer are all interchangeable with Schacht’s other wheels and there will be a bulky flyer capability. 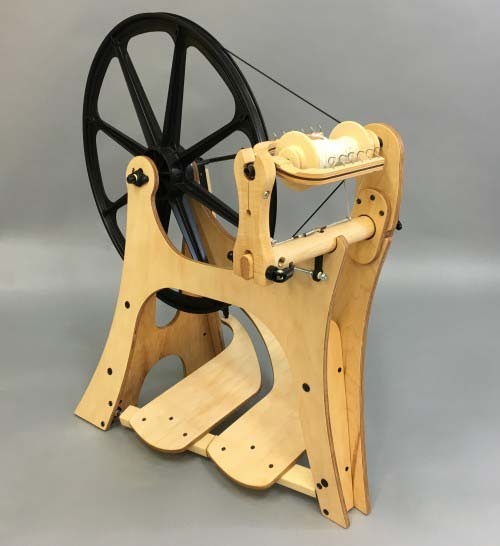 Like all Schacht products, the Flatiron wheel was thoughtfully designed and beautifully crafted. 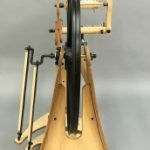 See all the details on the new Flatiron Spinning Wheel on our website. 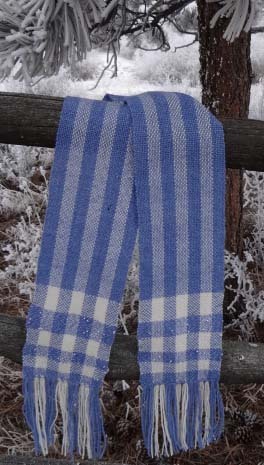 The Glacier Beaded Scarf above was woven using beautiful Alpine Meadow Yarns. It weaves up fast on the Cricket and Flip Rigid Heddle Looms. Scarf Shown above was woven using Alpine Meadow Yarns Periwinkle, Winter Wonderland and Beaded Alpine Phlox yarns. It could also be woven in Dream Lake, Winter Wonderland and Beaded Pearly Everlasting Yarns. Ever wanted to learn how to weave? 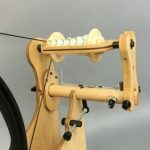 The Inkle Loom is a simple and inexpensive loom for weaving bands, and is easy to learn how to use. 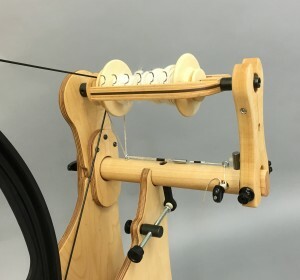 Weaving on the Schacht Inkle Loom Video above is by Jane Patrick of Schacht Spindle Company and shows how to set up the Schacht Inkle Loom and get started weaving your first band. They have so many great colors to work with! 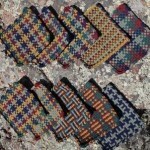 I went on to weave 10 more potholders this time using 5 different colors. 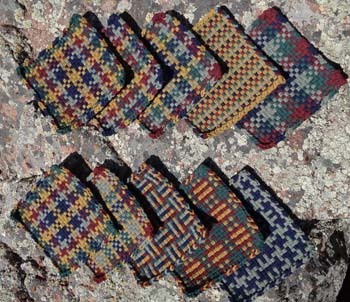 I am currently weaving Classic Size Potholders using the same 5 colors to complement my larger Autumn Colors potholders. 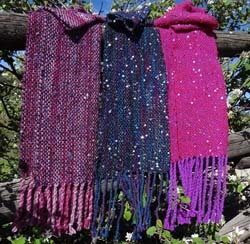 Pictured are 3 Sequined Scarves that I wove earlier this year. These fashionable sequined scarves were fast to warp up at 5 ends per inch and they wove up quickly. The sequins are plied right in with the yarn so there is no fuss weaving with them. The scarves look quite festive with the sequins and will make great gifts! I wove all three on my 10″ Schacht Cricket Loom using Alpine Meadow Yarns Sequined Novelty Boucle for the weft and Brown Sheep Yarns for the warp. Links to the free patterns follow: Glistening Berries Scarf Pattern, Razzamatazz Scarf Pattern, Bedazzled Scarf Pattern. 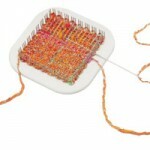 Rigid Heddle Weaving Kits are available. 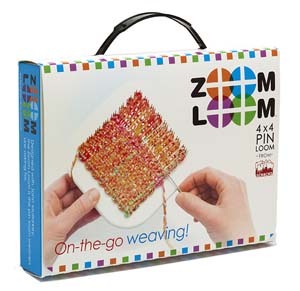 The Schacht Zoom Loom – Portable Weaving! We also have fun Critter Kits by DJE Handwovens for various animals including a Sheep, Frog, Lion, Turtle, and Chameleon. 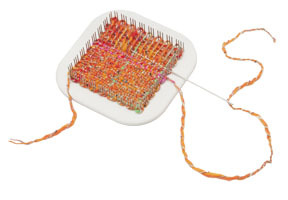 How-to Weave on the Zoom Loom video by Denise Renee Grace at Schacht Spindles is below. 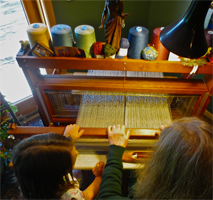 Penelope, one of my customers shared with me how her Granddaughter Neva is weaving with her on her floor loom. They sit side by side on the bench. Neva sometimes holds the shuttle for Penelope. 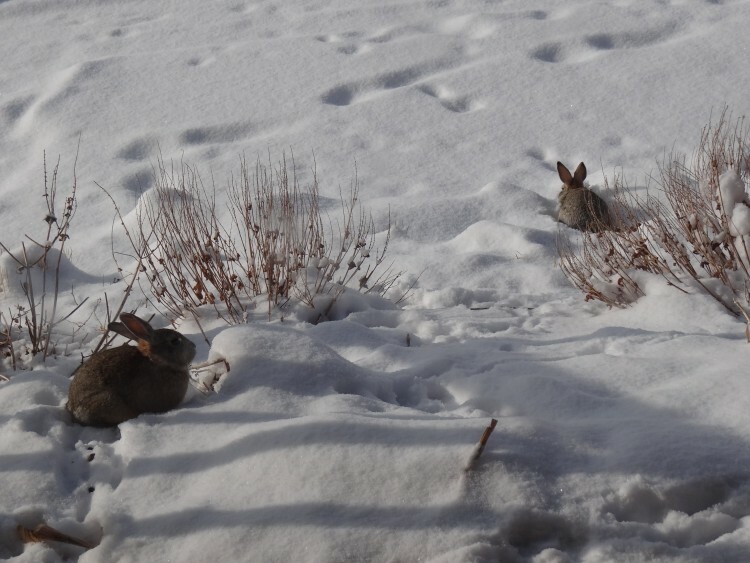 There could be no better way for Neva to get started weaving than with her loving Grandmother! Note from Penelope about the photo: She always says, “beat” at this moment. She has been quick to pick up on the terminology. By the way, it was the bobbin winder which first attracted her to the loom. You may or may not recall that I needed to get a replacement elastic loop for the wheel as it received a bit more vigorous use than usual. Penelope told me that Neva sometimes sits at the loom with her Teddy Bear and holds the shuttle and explains to her bear what weaving is all about. Oh to be a fly on the wall when she does that! ©Copyright 1988-2019 BOUNTIFUL, All Rights Reserved.